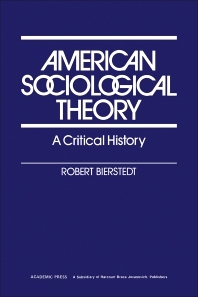 American Sociological Theory: A Critical History discusses the history of American sociological theory by providing a selective and critical account of ten writers largely involved in the subject. Chapters 1 to 10 of this book are devoted to the contributions and investigations of ten acclaimed sociological theorists— William Graham Sumner, Lester Frank Ward, Charles Horton Cooley, Edward Alsworth Ross, Florian Znaniecki, Robert Morrison Maclver, Pitirim A. Sorokin, George A. Lundberg, Talcott Parsons, and Robert K. Merton. The sociological label, legacy of Spencer, normative taboo, American references, and the ""Holy Trinity"" (Marx, Durkheim, and Weber) are also elaborated in this text. This publication is a good reference for students and researchers conducting work on general sociological theory. On "Sociological Theories of the Middle Range"